Happy National Black Forest Cake MARTINI Day! TOAST PECAN DAY with Pecan Martinis, Candied Pecans & Pecan Liqueur! Enjoy and have a lovely, nutty PECAN DAY! 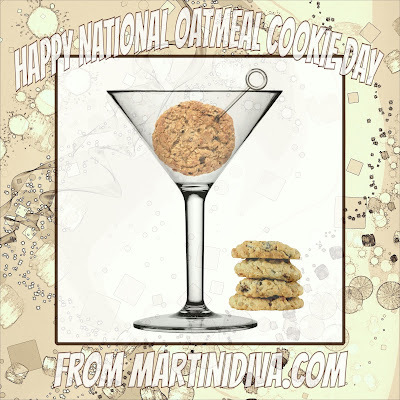 IT'S NATIONAL GOOF OFF DAY so GOOF OFF WITH A MARTINI . . . or 2 or 3 or 4 . . .
What are your plans for Goofing Off?? 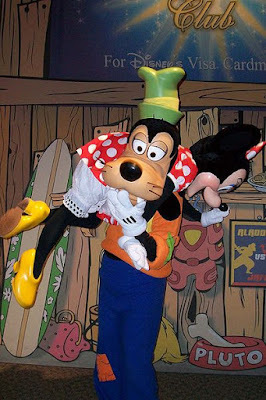 It's National Goof Off Day so I goofed off and didn't post any cocktails. However, may I suggest you use my search option at the top right of this site and search for any spirit, flavor or cocktail you might need to help you goof off too. Now, excuse me - I have to get ready to Goof Off the rest of the day. . . . where's my cocktail and the remote? I wonder why there is a day to celebrate jackasses. Seriously, are you going to celebrate the fact that you have to deal with jackasses? No, me either. 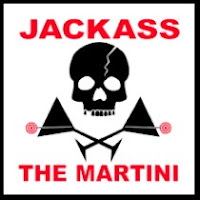 So I prefer to look at National Jackass Day as National Jackass Therapy Day - this is the day you get to toast yourself for having to put up with all the jackasses that pop up in your life! Now, this martini is not for you good folk who have had to put up with the jackasses - you need to treat yourself to one of my other cocktails. 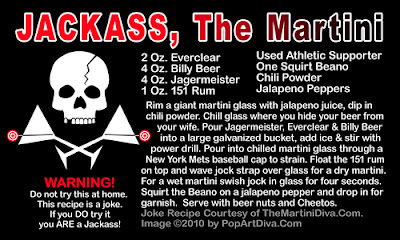 No, THIS martini is for the jackasses themselves - after you read it you'll understand why. Yes, the recipe is a joke . . . . but putting up with jackasses isn't a joke, so if you have had to deal with one lately (or ever) today is your National Jackass Therapy Day. Shake up one of my non-joke martinis and spend Happy Hour telling stories about the biggest jackasses you've ever encountered. 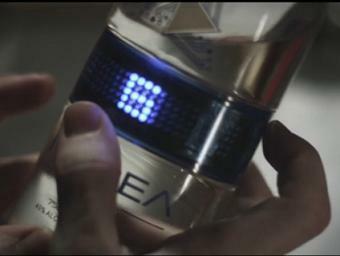 You can actually make this cocktail, minus the jockstrap and probably the Beano, but, really, who'd want to? SPRING MARTINIS for the 1st Day of SPRING! "the earth’s elliptical orbit is changing its orientation (skew), which causes the earth’s axis to constantly point in a different direction, called precession. Since the seasons are defined as beginning at strict 90-degree intervals, these positional changes affect the time the earth reaches each 90-degree location in its orbit around the sun." On those years when we have that extra day (think Leap Years here) Spring may fall on March 21st! All I know is that sometime in the middle of March flowers are starting to sprout, the weather is warming up and all sorts of wonderful seasonal fresh fruits and veggies are showing up in the local markets! That, of course, means they are ending up in my cocktail shaker and martini glasses! Spring is a time for rebirth, renewal and regrowth and the bounty of the earth at this time of year is particularly good for refreshing and renewing the body after a long winter. I like the idea of bringing all that fresh Spring goodness to my martinis - a healthy martini is yet another excuse to have a martini, right? My final St. Patrick's Martini is the Shillelagh Martini, a naturally green gin martini thanks to the Blue Curacao and orange juice mixers. If this doesn't put the Irish in your day you might just need to get pinched! BUY The Scarlet FiddleDeeDee Cocktail Card HERE. Think of the color of Scarlett's eyes, add a little whiskey for her spirit, a little sugar for her charm and some lime for her tart tongue and you have the Scarlett O'Hara Martini. I've taken a whiskey sour and given it a little bit of Ireland, the Old South and Hollywood in one glass. This martini is dedicated to the most famous Irish movie character ever to grace the silver screen and my favorite movie heroine, Scarlett O'Hara. I was practically weaned on Gone With the Wind and it is still my favorite movie of all time, so I can't let St. Patrick's Day go by without a nod to this infamous Irish Southern Belle. Admittedly, the lyrics are not on the same level as the music itself but after a few Scarlett O'Hara martinis, frankly, my dear, you probably won't give a damn! 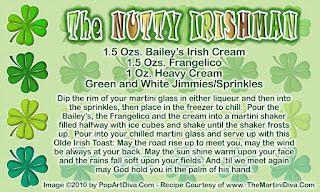 BUY The Nutty Irishman Cocktail Card HERE. A favorite Irish Cocktail lands in a martini glass. If you're fond of Frangelico and Bailey's you'll love this martini. It's very sweet, almost a dessert cocktail with a creamy texture from the Bailey's and the cream and a nuttiness from the Frangelico. It's quite rich but you can use either half & half or milk in place of the cream for a little less guilt on St. Patrick's Day! 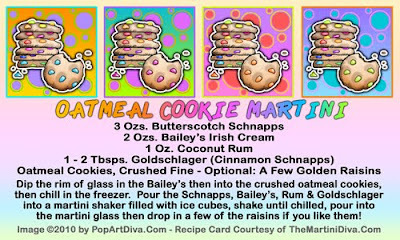 BUY The Shamrock Martini Recipe Card HERE. If you're not into green beer or Irish whiskey, why not give my Midori Shamrock Martini a try? It's green like the green beer but this is naturally green from the Midori melon liqueur. The melon flavor is enhanced by using melon vodka as well so you get a double rainbow of goodness for your St. Patrick's Day cocktail! 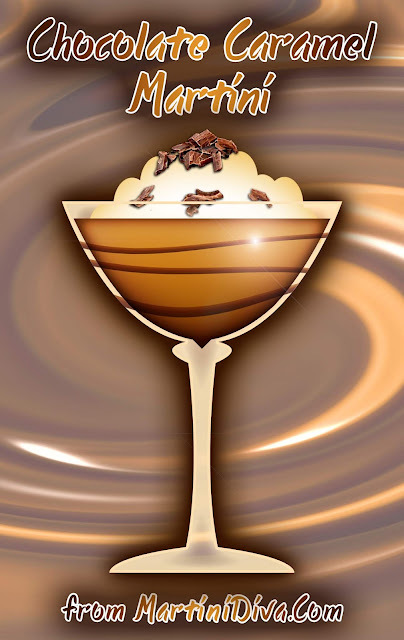 BUY The Irish Kiss Martini Recipe Card HERE. You might think you're not a whiskey drinker but the Irish Kiss Martini might just change your mind. Combined with a chocolate and a mint liqueur whiskey gets a nice little St. Patrick's Day makeover and could make you a whiskey lover. Green and white sprinkles (jimmies) on the rim lend a festive lucky rim and add a bit of sweetness as you sip. Looking for a little excitement in your life? Has happy hour turned dull and boring? 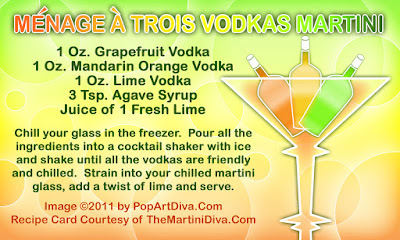 Maybe it's time to "mix it up" by adding a little something extra to your cocktail time, The Ménage à Trois Martini. I know what you're thinking, now get your mind out of the gutter, I'm talking about shaking up your bar life with a triple threat vodka gimlet. This cocktail has taken a ride on the wild side with two flavored vodkas added to the traditional mix. Using Ruby Red Grapefruit Vodka, Lime Vodka and Mandarin Orange Vodka in place of plain vodka, you add some zing and zip to this classic cocktail. This is not a drink for the timid but if you're in need of a serious sip of vodka with a little excitement thrown in, give it a try. Just don't expect to walk a straight line afterwards. 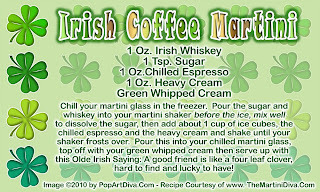 BUY The Irish Coffee Martini Recipe Card HERE. This martini is inspired by the famous Irish Coffee created and still being enjoyed at The Buena Vista Cafe in San Francisco. This is a cold version created specifically to enjoy in a delicate martini glass but the lovely Irish Whiskey and espresso come through as a nice iced coffee experience so enjoy! BUY The Emerald Isle Martini Recipe Card HERE. The Emerald Isle Martini is a fun Green Martini with a tequila base - just in case you're not a whiskey fan. Think "Irish Margarita" with a tropical flair! 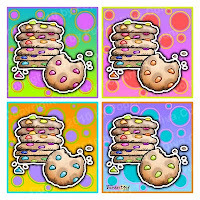 BUY The Blarney-Tini Card HERE. Time again for the Green Martinis, Irish Whiskey and some lucky St. Patrick Cocktails as we head towards March 17th. I've put together a fun collection of some tasty Irish Cocktails, starting with my BLARNEY-TINI. A yummy combination of Irish Whiskey and mint liqueur, this one is sure to show you the way to the pot of gold at the end of the rainbow! Inspired by the famous Hurricane cocktail of Pat O'Brien fame, my Mardi Gras Martini is a mini-me version of this classic Carnival cocktail. Chock full of rum and masked as a martini complete with a rainbow sugar rim, you can dress it up even more by twirling some Mardi Gras beads around the stem. Never been to Mardi Gras? Wondering what all the fuss is about? 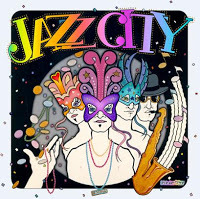 Read about Mardi Gras on the Mardi Gras Martini Recipe Page and find out exactly why it's called Fat Tuesday. This is a seriously sweet cocktail, but then white chocolate is a seriously sweet candy. 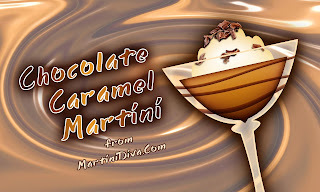 I admit to preferring my Chocolate Cheesecake Martini, but I have a friend who loves white chocolate best so I developed this cocktail specifically for her. To each his own, especially at happy hour, I'm not one to judge! For myself, I add a few drops of some chocolate or coffee bitters and a pinch of salt to counteract the sweetness. It's your choice on those small modifications. Dip the rim of the glass in some of the white chocolate liqueur then into the dry cheesecake jello mixture. Add the ingredients to an ice filled cocktail shaker, shake until chilled then pour into your chilled glass. Shave some white chocolate over the top and serve. 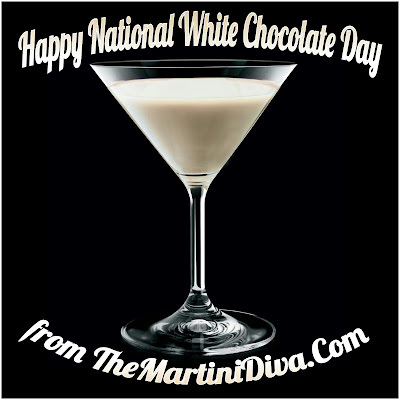 You can get the White Chocolate Cheesecake Martini Recipe Card Here. September 22nd is National White Chocolate Day and March 6th is National White Chocolate Cheesecake Day. You've probably heard of Absinthe at one time or another, most likely in the context of the proclaimed "psychotropic dangers" of this unusual alcohol. Possibly you heard it mentioned in relation to such notables as Van Gogh, Degas, Picasso, Ernest Hemmingway or Oscar Wilde. It was the darling of Happy Hour during the 17th Century in Parisian bistros, the liquid muse of the free thinkers of the day and it became an integral part of the bohemian culture of the times. 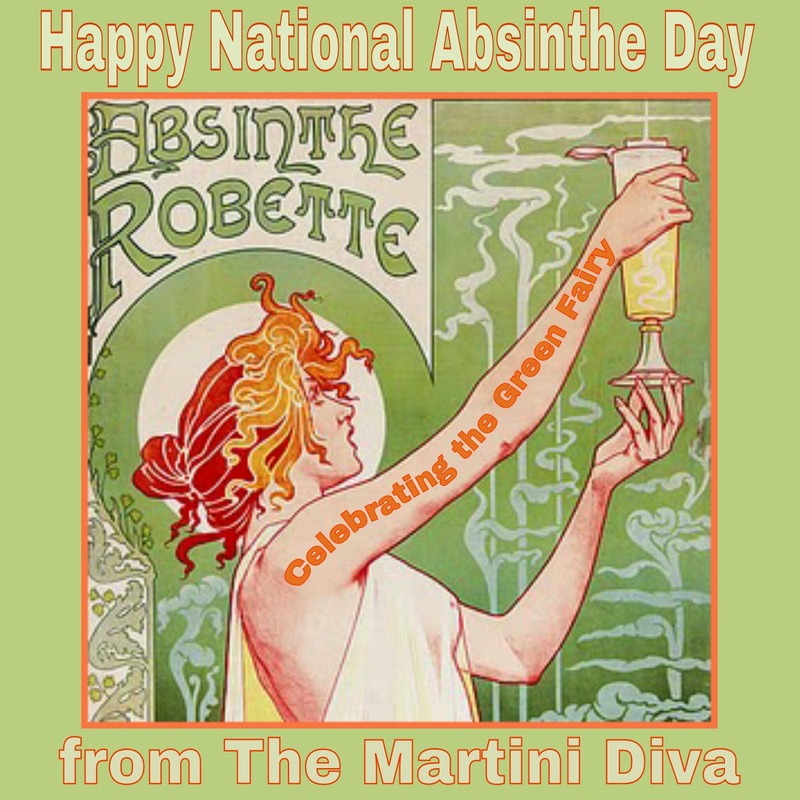 Absinthe is a pale green aperitif with a licorice like flavor that will louche (turn milky) when water is added. It was originally made with grand wormwood (artemisia absinthium) and Green Anise, petite wormwood (artemisia pontica, aka Roman wormwood), fennel, and hyssop. The wormwood oils are what contains thujone, the ingredient thought to be the psychoactive agent that caused all the trouble. The true story is more complicated than that and revolves more around the higher alcohol level of Absinthe (sometime up to 72% alcohol), abuse of the drink, cheaper contaminated versions and the hysteria of the Victorian era. The name Absinthe is actually of Greek origin, the root word being "apsinthion" which translates as bitter. The bitterness of this liqueur comes primarily from the wormwood. Wormwood is a herb related to the daisy family that grows wild in many areas of Europe. In too high a dose thujone is dangerous but the thujone actually found in absinthe is many thousands of times lower than the dangerous level, especially in today's federally monitored versions. From ancient times thujone has been prized as one of the most valuable medicinal herbs. An Egyptian papyrus from 1600BC praises the medicinal qualities of wormwood, Pythagoras believed that wormwood leaves in wine would ease childbirth and Hippocrates recommended it for anemia and rheumatism. Today, wormwood oil, the oil obtained from Artemisia absinthium can be found in many over the counter remedies here in the U.S. Thanks to the sensationalism of the Lanfrey Murders, the movement to ban the liqueur, fueled by the Temperance Movement and the morals of the times, turned Absinthe into the evil green devil of the day. It was blamed for madness, murder and mayhem - some even said it was Absinthe that drove Van Gogh to chop off his ear! 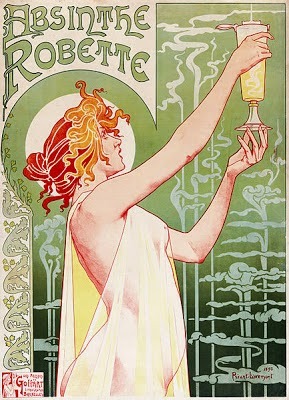 After many petitions and powerful opposition to the liqueur, Absinthe was made the scapegoat of much of the insanity and infamy of the era and the pressure was on to remove it from the reach of the public. First banned in the Congo Free State in 1898, then in Brazil and in Belgium in 1906, Holland followed in 1908, Switzerland in 1910, the USA in 1912 and finally in France in 1915. Recently these bans have been lifted in many countries in Europe, including France, the United States and Canada and Absinthe is enjoying a Renaissance in the cocktail world. 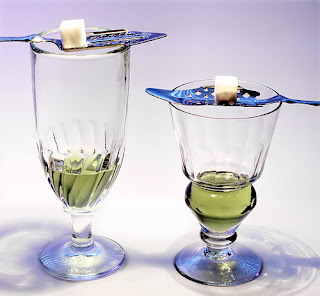 La Louche is the classic ritual of drinking Absinthe where a perforated spoon holding a cube of sugar is set over the glass of the aperitif, and cold water is slowly poured over the sugar and spoon turning the translucent green liqueur into a milky, opalescent drink. The cold water serves two purposes, first it dilutes the strength of the powerful alcohol and second, it purportedly released "The Green Fairy" i.e. the hallucinogenic qualities of the wormwood in the Absinthe. The Green Fairy was more than a nickname for Absinthe, in the late 1800s it was also a symbol of artistic enlightenment and exploration, of poetic inspiration, of free thinking and changing social orders, thus making it the "Green Muse" or "Green Goddess" of artists and writers alike. Contrary to popular believe, setting the sugar cube on fire was not part of the original ritual, but is a more recent addition. Made legal again here in the U. S. in 2007, today's versions of Absinthe contain less than 10mg of thujone per litre (in keeping with the EU regulations), and the alcohol volume is considerably lower. There is a great resurgence of interest in this aperitif and you'll find it popping up in chic bars and restaurants all over the country. You can now enjoy Absinthe Cocktails and even the Ritual of La Louche without fear of flashbacks or insanity (or loss of ears) from enjoying this unusual and historical apertif. Combine ingredients over ice and gently stir. Garnish with a lime twist. Shake. Strain into cocktail glass. Garnish with a lemon twist. Serve. 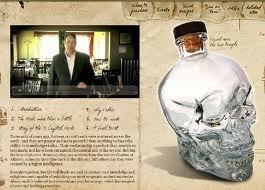 Add ice to a tall tumbler, pour in the ingredients, fill with ice water, stir slowly and serve. March 4th is National Pound Cake Day. While this may not seem like a particularly momentous holiday it does give occasion for enjoying yet another martini - in this case, my Pound Cake Martini. Melt the chocolate chips in the microwave or a double boiler, the rim of the glass in the melted chips. Then chill glass in freezer. I have the vodka and pineapple juice to cocktail shaker filled with ice and shake until chilled. Traditionally pound cakes were made with apound each of four ingredients: flour, butter, eggs, and sugar. This made quite a bit of pound cake so people probably cut the measurements, but having an equal parts recipe was most likely an easy way to remember and pass down the recipe during a time when most people could not read. Dating back to the early 1700s, the pound cake is a British creation, though there are variations on the basic recipe from countries the world over. After rising agents were invented in the 1800s, recipes for pound cake changed in order to create lighter versions and to create unique flavors and tastes. 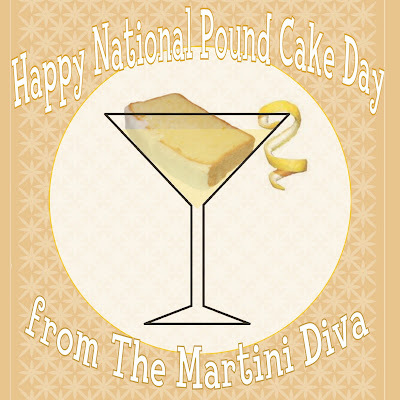 Enjoy your Happy Hour and remember, neither this martini nor the cake itself are called pound cake because they pile on the pounds. Love Banana Cream Pie? 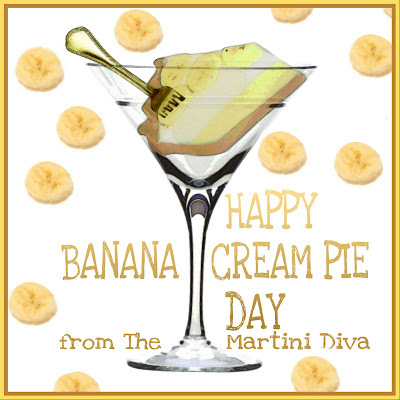 Then today is your day because it's National Banana Cream Pie Day, which means, of course, here at The Martini Diva Blog it's Banana Cream Pie Martini Day! Rim glass with crushed white chocolate chips then chill glass in the freezer. Add the ingredients to an ice filled cocktail shaker. Garnish with the banana slice and serve. Bananas are a good source of vitamin C, potassium and dietary fiber. Alexander the Great discovered bananas in 327 B.C. during his conquest of India, making this one of the first records of the banana. Bananas do not grow on trees, they grow on a plant which is technically an herb with the banana being a berry. Bananas have a natural antacid effect in the body. Happy National Banana Cream Pie Day. Yet Another Excuse to Enjoy a Martini! If you're fond of peanut butter you're in luck today because it's all about peanut butter here to celebrate Peanut Butter Lover's Day. 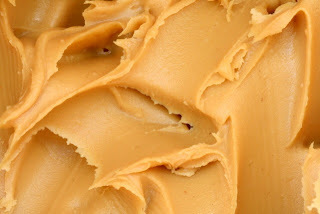 Peanut butter is the leading use of peanuts in the United States.